Since the demise of the great Vassili Alexeiev the iron pumping world had been awaiting a new Hercules and in 1998, some 30-years after the Soviet's retirement, a 20-year-old Iranian super heavyweight stepped up to the lowest step of the Asian Games podium with just a hint he might be that man. Alexeiev stood 1m86 for 160kg while Hossein Reza Zadeh stands 1m85 for 168kg. The Soviet remained unbeaten between 1970 and 1978 while the Iranian is now unbeaten since 2000. At the same event where the marvellous Naim Suleymanoglu failed in his quest for a fourth Olympic title at Sydney the immense Hossein Reza Zadeh came to the fore to pick up the baton from the little Turk a third his size. Few had expected the Iranian to end a 40-year period (not including the Los Angeles Games) of Russian and Soviet Olympic dominance when at 22 he did just that at the tender age of 22, the youngest super weight champion in Olympic history. He was born at Ardabil, near the Caspian Sea coast the third of seven children and took up weightlifting at 15 on the advice of a sports teacher. Since that first bronze at age 20 in his first major tournament, Reza's legend has never stopped growing in stature, with two Olympic gold medals from 2000, four world titles from 2002, 2003, 2005 and 2006 and a clutch of world records to boot. His quirky rituals have therefore also become rather famous, a prayer before the weights, Iranian flag draped across his shoulders and brandishing a photo of Iran's Islamic revolution hero Ali Khamenei when taking the podium. Hossein Reza Zadeh is something of an idol not only in Iran but worldwide. When Iran were banned from the Asian Games in 2006 due to nine failed dope tests from 11 athletes tested not only did Reza's name not appear on the guilty list but the international federation allowed him alone from Iran to compete. Tha fact his wedding at Mecca was broadcast live by Iranian state television is a measure of his popularity and he has been decorated by Iranian president Mohammad Khatami. Ahead of the Athens Games Turkey tried to 'recruit' him with promises of untold wealth. "I'm Iranian," he said. "I love my people and my country." 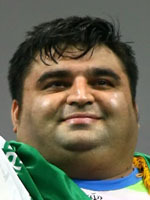 At Beijing, Hossein will be pushing for a third straight Olympic title, for Iran and for Allah.